Ungespundet: good work! Friendly atmosphere - at least last Saturday it was! Wagner Märzenbier: full orange- to rich amber color; clean, rich malty nose in accordance with the style. Modest head retention. A full malty body dominates throughout until the finish, where a gentle hop note rounds out the aftertaste. Good clarity. Excellent example of a Märzenbier; for those who are new to the style, this is a good place to start. A very friendly countryside locale, full of regular patrons playing cards. Every beer they offered that day was okay, but all were very approachable to the point of nearing blandness. The Weisse was my favorite simply because it didnt make me investigate it to find any flavors (and they were well presented as well), but others were simply very timid and lacking in character. 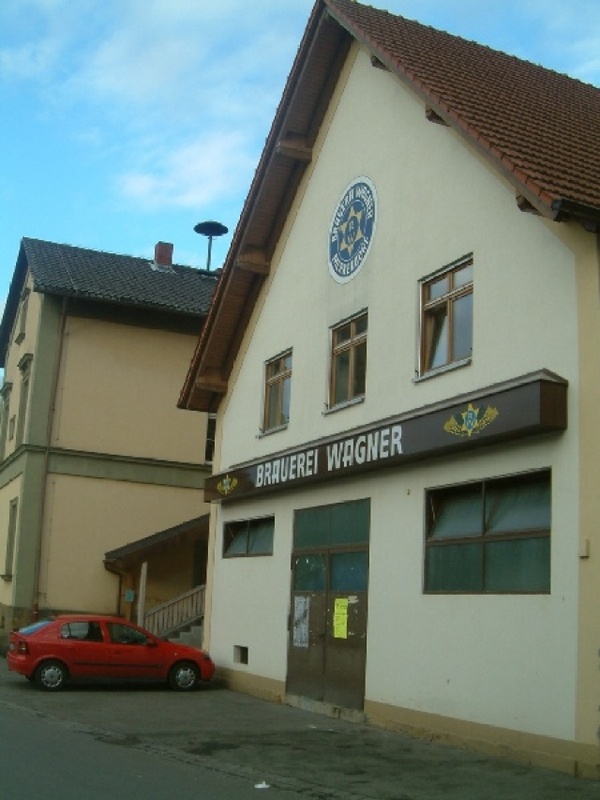 The next time Im in Merkendorf, I will head straight for Brauerei Hümmel, only a few steps away. -Plentiful banana esters and frolicking yeast tickle the nose. -The hazy yellow is covered by a creamy head. -Mouthfeel is well-fed, rich but drinkable. -Finishes softly, with yeast brushes and doughy cereals. -Im happy to see that Joss and Joris got here on a better day; all we got, except this Weizen, was bland and uninspired. -Fruity cereal and diluted caramel form a curious nose. -Caramel comes back in the flavor, shyly, undecided if its going to take control or let another component attempt balance. -The smooth carbonation cant help it, theres just not much going on here. -There is but a ring of foam around the veiled bronze. -Body is relatively thin for an Ungespundetes, Spezials must be twice as nourishing at least. -Dry cereal and peppery hoppiness first greeted me, politely. -A ring of head evaporates from the filtered dark golden. -Some dry hay blades rest on running caramel. -Body is a little thin again; I dont think they were getting as good an extraction as they can have. Other people here have tasted much better results it seems. -Some citrusy hops escape the timid aroma. -There is barely a ring of head to crown the pale yellow. -Body is frail, and near lifeless. -Straw is looking for hops to help it out, but is still waiting. -A few buildings away, Hümmel had a much better pilsner that day. When I tasted the beers, the soft and pleasantly hoppy Lagerbier had some apples and mold and the more neutral Märzen had some butter. The Pils was more like an Einheitsbier. Simple, country pub is anther 1970's re-fit. Two bocks were available. The Bock Hell was average while the Bock Dunkel was very pleasing. I was happy to spend my morning reading in this very quiet pub. Was there yesterday with my beer pals and tried: Lager, Pils, Märzen, Dunkles. The Lager is low in gas, hoppy, spicy, very Kellerbier-like. For my taste that one was the best. The Pils was lacking in hop and character; the Märzen was very alcohol pronounced and sweetish; the dark beer was quite nice: Malty without sweetness. Next time I'd drink the dark beer and the lager only. We stopped here on a Friday afternoon while walking around the area in January. Smaller place than Hummel nearby, but also busy and traditional. Only had one beer here and no food, but I'm happy to report that this place is open and seems to be doing well.